Since discovering liquid lipsticks, my love for normal lippies has flailed. I no longer lust after MAC lipsticks anymore and find myself wanting to find the best liquid lipsticks that are worth the money. This month I’ve been on the lookout for a grey based liquid lipstick which won’t make me look too ego/rock chick. Not that there’s anything wrong with that look, it’s just not me. 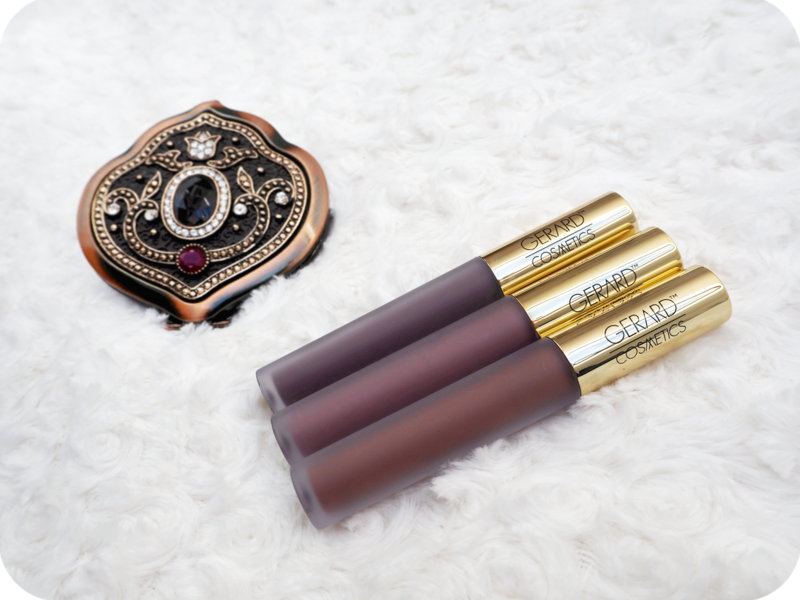 So after a good few hours googling, I came across some swatches from Gerard Cosmetics and got some serious FOMO on not owning any GC products. I had a quick look on all my favourite retailer sites before deciding to use Beauty Bay to place my order. All the shades look so beautiful that it took me another hour deciding on which shade! The lipsticks are priced at £9.50, which to me is perfectly reasonable. In fact I was so surprised at the price that I decided to purchase not one but 3 different shades. I opted for Iced Mocha, Invasion and Gravity. As always Beauty Bay were great at getting them sent over to me pretty soon after I had ordered. 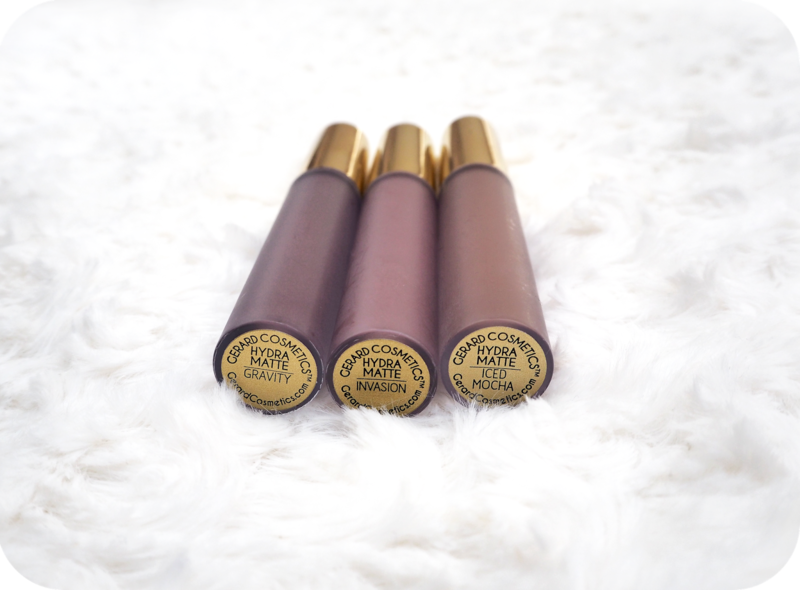 The lipsticks come in matte frosted glass tubes with a bright gold cap. As with all good liquid lipsticks the cap has a doe footed wand attached. The actual brush is the longer kind, which in my opinion is much better for control, especially when you have thin lips like me. Gerard Cosmetics have surprised me. I really wasn’t expecting much from them at all but I have to say the quality is on par with some of the more expensive higher end brands. The lipstick has a thick but creamy consistency and is very pigmented so you only need one coat. The formula dries within a minute and isn’t sticky. Considering it’s called hydra matte, I thought it would dry out my lips or get flaky fairly quickly but neither of them was the case. My lips didn’t peel, flake or feel uncomfortable at all during wear time. I did the ultimate test and the lipstick are not fully transfer proof so that means they do rub off slightly if you touch, kiss or eat with them on. If however like me on a manic work day you don’tt do much eating, then the lipstick will last a good 7 hours. As much as I love life proof liquid lipsticks I find it such a pain having to take them off. Gerard Cosmetics liquid lipsticks gave me no trouble though, a good few wipes with micellar water and I got it off my lips without any fuss. The darkest shade I purchased was Gravity and I didn’t find that it stained at all which I was so glad to see. Nothing worse than having stained lips which make them look bruised! I was going to do three separate posts for each colour but since they’re similar shades I thought it would be better to combine them all into one so you can see the difference better. 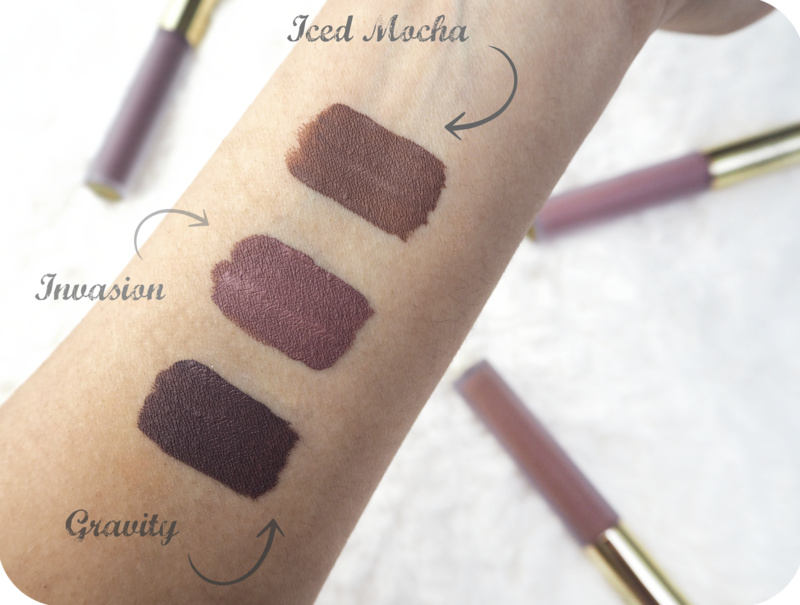 Iced mocha is a reddy brown, Invasion is a grey based lilac/purple and gravity is grey based plum colour. Considering brown and purple are quite dark colours, these are quite muted which makes them great for everyday wear. I love all three colours equally and I am without a doubt going to be purchasing ALL of the other shades as soon as pay day comes around. Having tried and tested my new purchases over June and some of July, I have to say that I’ve found another great brand that I am fully getting behind. So far everyone that I’ve recommended these lipsticks to have already placed an order and I 100% recommend them to you all too. As a separate side note, GC also have great customer service, so major plus points on that front and their staff were so helpful in explaining that their products are cruelty free. Hydra Matte Liquid Lipsticks are available in the UK from Beauty Bay and the Gerard Cosmetics website.